1. 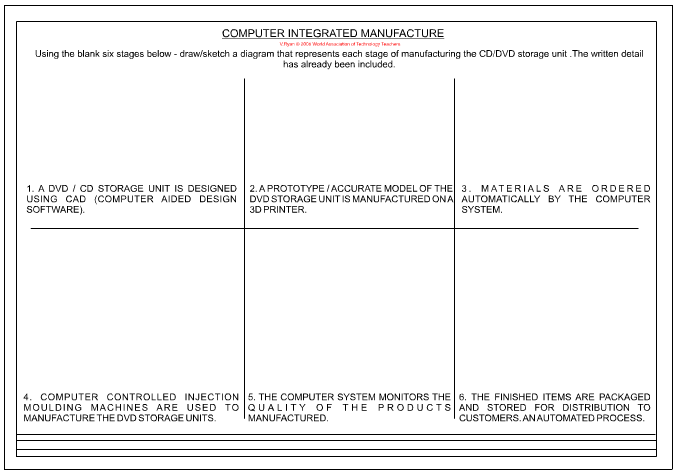 A DVD / CD storage unit is designed using CAD (computer aided design software). 2. A prototype / accurate model of the DVD storage unit is manufactured on a 3D printer. This allows the design team to check that the design is perfect, before full scale manufacture takes place. 3. Once the design has been agreed by management materials are ordered. Once production of the DVD storage unit starts all ordering is carried out automatically by the computer system. The system monitors the use of materials in the factory and reorders materials and components as they are required. Spreadsheets are used for this purpose. 4. Computer controlled injection moulding machines are used to manufacture the DVD storage units. The computer system controls the amount of polystyrene granules fed into the machine, it monitors the temperature as it rises and controls the injection of the fluid polystyrene into the moulds. 5. The computer system monitors the quality of the products manufactured. In this example the DVD storage unit is tested for accuracy of manufacture by measuring vital distances. Storage units that are too small or large are rejected and their materials recycled. 6. The finished items are packaged and stored for distribution to customers. This process is automated, controlled by the computer system. The finished items are moved efficiently round the factory to the storage area. Computer controlled vehicles carry out this job.